Back in the days before Google search—circa 1992—I wanted to know who said, "History is a cruel trick played on the dead by the living." I had my suspicions it was Voltaire, but I couldn't find the attribution. So I called the Reference Desk at the Phoenix Public Library and a very nice woman down there took up the challenge. It took her several days (oh, the Humanity!) and when she called me back she told me she looked and looked but she couldn't find it either. I had a book deadline and wanted to use the quote, so I came up with a creative band-aid and attributed the quote as an "Old Vaquero Saying." Thus, the birth of Old Vaquero Sayings, which is a staple every month in our Truth Be Known section of True West magazine. I have long thought Old Vaquero Sayings would make a good, little bathroom book and the boys down at Cattle Track Arts Compound—Mark and Brent—agree, and we have decided it's going to be our next project. 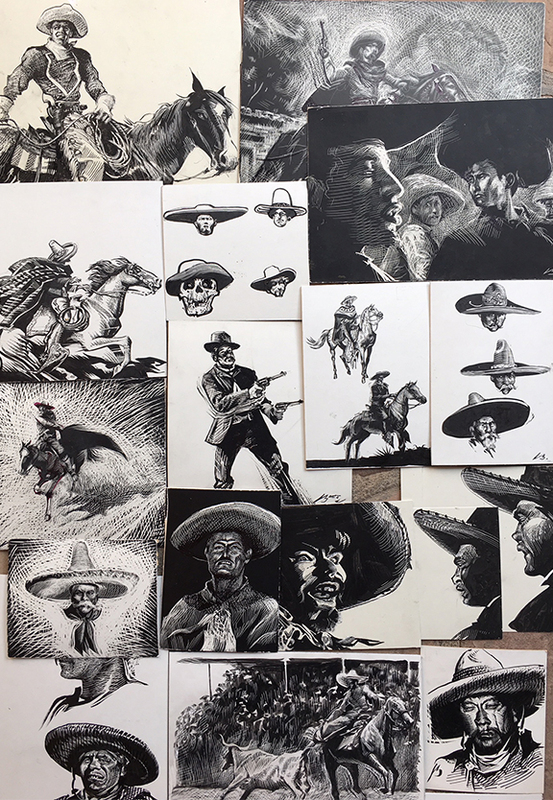 Daily Whip Outs: "A Gaggle of Old Vaqueros"
In addition, I have half-a-dozen other boards in the works and I'll post those as we move along. "History is a pack of lies we play on the dead," and "History is after all a pack of tricks we play on the dead." I'm sorry, but I like my version better. "a cruel trick" is just a tad more undeserved and descriptive of the corrosive and unsettling nature of the process, but then I have been saying it for a quarter century and that probably disqualifies any objectivity I might claim. "A generation which ignores history has no past—and no future." "Most historical facts are unpleasant." "I like the dreams of the future better than the history of the past,—so good night!" "If Napoleon had nuclear subs, we'd all be speaking French, so the history thing can be oversold." "Every decade or so, the world is tested by a crisis so grave that it breaks the mould: one so horrific and inhumane that the response of politicians to it becomes emblematic of their generation—their moral leadership or cowardice, their resolution or incompetence. It is how history judges us." "History has been too often a picture of the bloody stream. The history of civilization is a record of what happened on the banks."